I first read this back in 2007 (so LibraryThing tells me) and absolutely loved it. Or so I fuzzily seem to remember, as I could recall absolutely nothing about it when I yanked it out of the pile the other day. I reread it because I’ve had the sequel, Predator’s Gold, on my TBR pile for about two years and I wasn’t about to start that until I had a vague understanding of the first in the series. Well that, and my friend Lowri has been beating me over the head with the Philip Reeve Stick for a while now. I have to admit, I didn’t enjoy it as much this time round. I’m not really sure why, but I didn’t get into it fully until roughly a third of the way through. I just couldn’t summon the interest in the plot until that point. The ending, however, was just as amazing to me as it was the first time. Seriously. It’s easily one of my all-time favourite book endings. It’s unexpected, fast-paced and… well, brutal, especially for a YA book. The characters annoyed me a little this time round, as I found Katherine and Tom to be irritatingly naive about Valentine’s motives. The pragmatist inside me says it’s because I’ve become more cynical in the four years of living in the real world between readings, but it’s a bearable irritation nevertheless. More of a slight niggle than full-blown hatred as they don’t act particularly childish in other matters. The world itself is wonderful and a unique concept. The inner-workings of the Traction Cities (those that move around the Hunting Grounds on tracks) are nicely explained in technical but not over-whelming detail and feel almost believable. I’m looking forward to hearing more about it in Predator’s Gold. Unfortunately, it did violate one of the BookWorld’s most sacred commandments – Thou Shalt Choose A Tense And Stick To It. Grr. In a few places the narrative stopped using the past tense and switched to present tense for no discernible reason. Good Lord that’s irritating. 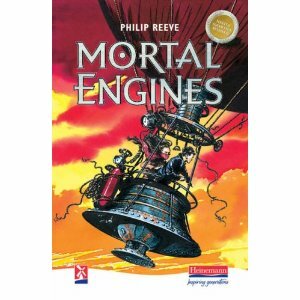 The sequel to Mortal Engines, still following the adventures of Tom and Hester as they battle against a terrorist organisation called Green Storm. A young girl seeks help to rid her of a terrible curse in a castle that wanders around on it’s own legs. It’s set in a completely different world to Mortal Engines, but it’ll quench your craving for more mobile dwellings, should you have such a thing.